Book your Dover Dunkirk ferry today. A Dover Dunkirk ferry is the best choice if you are planning on travelling through the more northern European countries. The sailing time is slightly more than a Calais ferry at 2 hours in total but you do arrive in the Nord just six miles from the Belgium border. 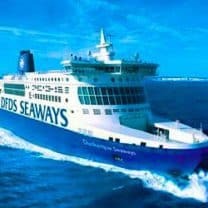 DFDS Seaways is the only operator to sail to Dunkirk and they operate up to 24 sailings per day at peak periods such as summer, normally 12 outside of peak times. The ferries that DFDS operates on this route are well regarded as being amongst the best ferries with high standards throughout. Either! Dunkirk is the English spelling. Prices can start as low as £22 for a return crossing with a car although expect to pay more at peak times. To get the best price, we advise is to book as far ahead as possible or book as many friends and family to come with you in your car! If you book a 9-person car, prices can be as little as £3.22 per person. Car and up to 9 people from just £29 each way for every trip. There is no limits on the amount you can have and these are available 24 hours a day for the entire journey. How Do I Add The Premium Lounge To My Booking? Simply select this as part of the booking process and your price will update automatically. Why Sail Dover To Dunkirk? Dunkirk is a better choice than Calais if you wish to travel through the Northern territories. The table shows some distances as per Google maps. The Dunkirk route is sometimes a quieter sailing than the very popular Calais route and can even be cheaper. If you want to consider all your options, take a look at our ferry to France page which lists alternatives. The journey to Dunkirk takes 2 hours and is slightly longer than the Dover to Calais ferry 90-minute alternative. You do end up further north as a result, making journey’s a little quicker overall if you are heading towards the north of France or into Germany and Poland. Take a look at the timetable below. These times are subject to change as per the operator. DFDS state their check-in booths are open 24 hours a day with the exception of Christmas Day and Boxing Day. Once you have made your way through the Dover Port barriers, make your way round to the correct lane and approach the DFDS booths. Important! Check-in closes 45 minutes before departure so be sure to allow enough time! DFDS operates 3 vessels on the Dunkirk route which all have shopping, restaurants and kid’s play areas. These vessels are classed as ‘D Class’ and are called – Dover Seaways, Delft Seaways and Dunkerque Seaways. They are purpose-built for this particular route.